Even sans the reigning MVP and Arwind Santos, SMB still won convincingly over Star while NLEX frustrated Blackwater in the 2016 PBA Commissioner’s Cup. The NLEX Road Warriors needed to shake off some early rust and hold off a second half rally before closing out the Blackwater Elite, 88-75, to pick up an Oppo PBA Commissioner’s Cup win in an Easter Sunday duel at the SMART-Araneta Coliseum. NLEX shot under 30-percent in the first quarter and had to weather an 18-4 turnaround from Blackwater bridging the third and fourth quarters but held strong to notch their fourth win in eight games, moving back up to .500 in the conference standings. 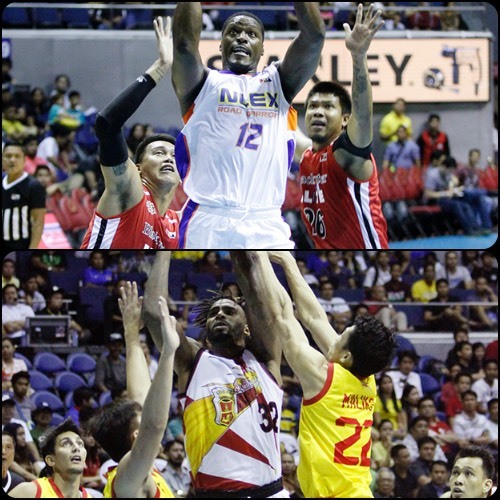 Asi Taulava and Al Thornton both scored 22 points to pace NLEX with the Fil-Tongan veteran adding 15 rebounds and four assists and the former NBA player grabbing eight boards of his own. 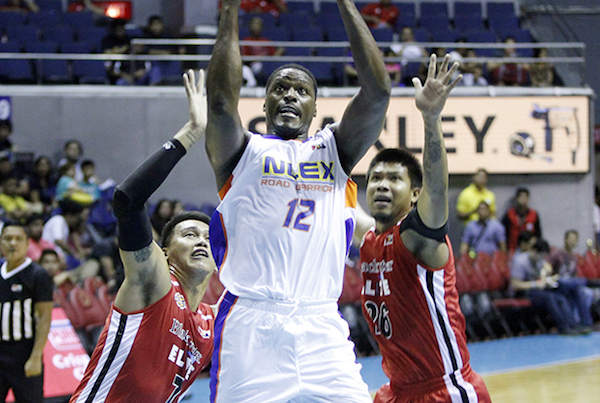 Al Thornton goes up strong for NLEX. 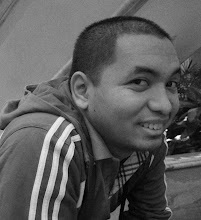 Art Dela Cruz attacks the D of Mark Borboran. 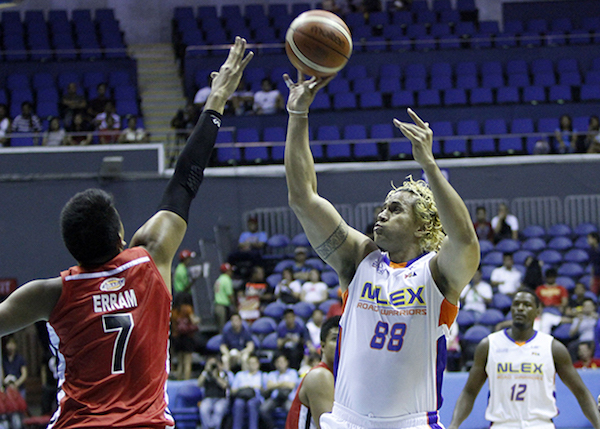 Asi Taulava recorded a monster double-double for the Road Warriors. 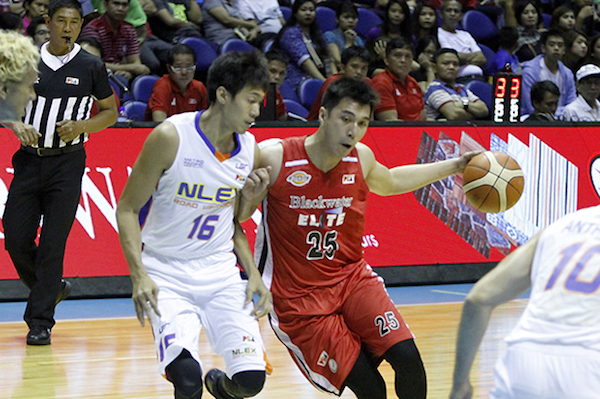 Sean Anthony also had 15 points and eight rebounds while Kevin Alas had 10. Rookie Arthur Dela Cruz led Blackwater with 16 points and 12 rebounds. Import MJ Rhett also had a double-double for the Elite (3-6) with 14 points and 18 boards, though he did have seven turnovers. 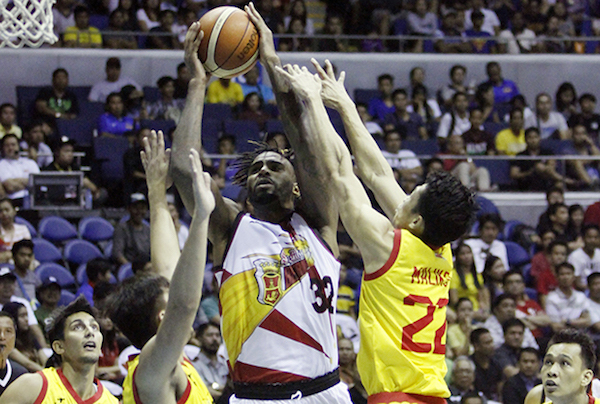 The San Miguel Beermen, even without MVP June Mar Fajardo and Arwind Santos, cruised to victory over sister team Star, 117-98, to snap the Hotshots’ three-game winning streak in the Oppo PBA Commissioner’s Cup on Easter Sunday at the SMART-Araneta Coliseum. Import Tyler Wilkerson turned in an impressive performance, notching 44 points and 17 rebounds to pace San Miguel, which improved to 5-2. Marcio Lassiter shrugged off a slow start to finish with 25 points, while Chris Ross nearly finished with a triple-double 11 points, nine rebounds and 10 assists. 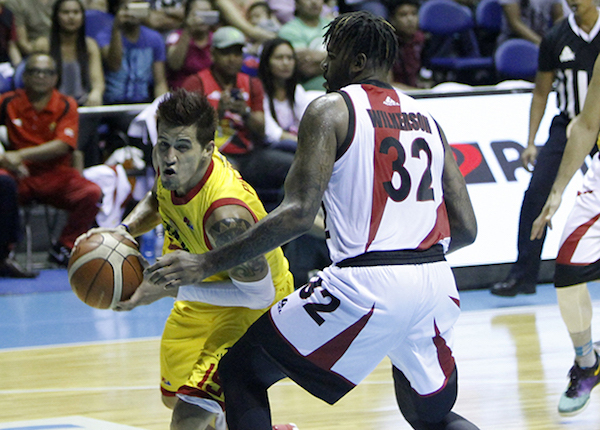 Marc Pingris tries to go around Tyler Wilkerson. 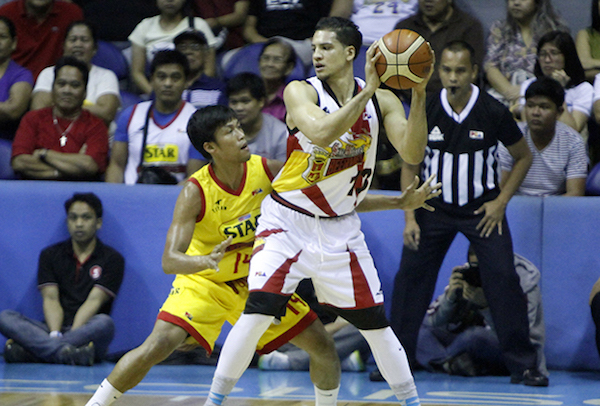 Marcio Lassiter had a big game in the absence of June Mar Fajardo and Arwind Santos. Tyler Wilkerson had another huge outing for the Beermen. Star was led by Ricardo Ratliffe, who had 33 points and 21 rebounds. James Yap had an explosive start – scoring 15 points in the first quarter – but limped out of the game in the second half with an injury. Star dropped down to 4-5 after losing for the first time in four games. All images are from the PBA.